An estimated 20,000 Guillemots have mysteriously died, with hundreds of them washing up on the Dutch coastline in recent days. As of yet, the reason for the mass death is unclear, though it's thought a recent storm during which 291 shipping containers fell into the sea – some anticipated to contain plastics and chemicals – may be linked. The bodies of the auks began to appear during the past month, with corpses found as far north as the Wadden Islands down to Zeeland in the south. The Netherlands has not experienced mass deaths on such a scale for at least two decades, and it's being treated as a major incident. Mardik Leopold, a biologist from Wageningen University, said: "The working hypothesis is that it is a combination of bad weather plus something else, and we are trying to find the smoking gun. "We have dissected some of the birds. They are clean but they were very skinny with gut problems, which is indicative of starvation. But we need a larger sample and so have been asking people to collect birds for us." 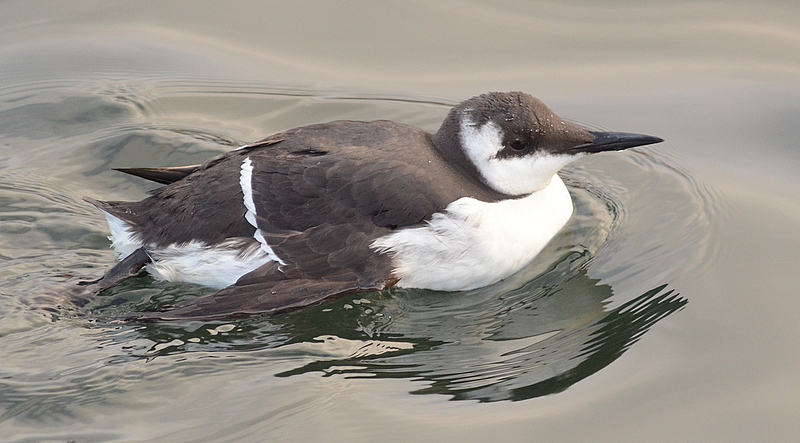 Some 130,000 Guillemots winter in the Dutch North Sea (Joe Graham). On 2 January a large Mediterranean Shipping Company ship lost 291 containers during a storm in the North Sea, to the north of Amsterdam. Fifty of these are still missing, with their contents unknown; it's thought the salvage operation will last another six months. Leopold added: "We don’t know exactly what was in the containers but there will inevitably be plastic and chemicals. "What is strange is that I have been in contact with colleagues in Germany and Belgium and they maybe have had one or two more dead birds but nothing that has alarmed them. A dead bird is found on every kilometre of beach along the Dutch coast every day and the rate is steady; it isn’t dropping off." In the coming days, veterinary pathologists will dissect some 100 Guillemots as they look for the reasons behind the wreck. Roughly 2 per cent of the global Guillemot population winters in the Dutch North Sea, mainly in the Frisian Front, just to the north of the Wadden Islands.